Full refund if 48 hours advance notice. If less then 48 hours, sorry no refund. Taxes not included - Occupancy tax 19 % per person per stay. Reception Time 09:00 to 18:00. (In case of late arrival please make sure to inform us via email or phone call). Happy Buddha Hostel Guatape is the perfect place for people looking to make new friends and explore . With nightly events and daily activities, you will not want to leave. Paintball at Finca Manuela, Tejo, horseback riding, moto tours, and wakeboarding off of our private beach are just a few of the many activities we offer. We offer a full bar and restaurant with free basic breakfast right next to our pool that over looks El Penon, the rock with the best view in the world. You can expect great service and clean amenities with comfy dorms and cozy privates, all of them have amazing views out their windows. There are dorms with bathrooms and each equipped with personal lockers. We also have 5 public bathrooms with hot showers. Our privates all have refrigerators and safes. How to get here: On the main road from Medellin to Guatape, 5 min drive after the town of El Penol there is a restaurant called 'Las Delicias de Pipe” on the left side of the road. Make sure the bus driver knows you want to be dropped off there. Once there you can arrange a pickup with the restaurant, it usually takes 10 mins for the jeep pickup. If you have data, it is always easier to coordinate with us directly. We also offer shuttles from our sister hostel Happy Buddha in Medellin that depart every Monday, Wednesday, and Friday at 9am. you can reserve a spot at their front desk. Breakfast, lunch, and dinner for purchase. This isn’t just a party hostel. It had really nice vibes while I was there and I ended up staying longer than originally planned. Fun group of volunteers and great staff. Spent two days practicing my Spanish with their great receptionist Daniela. Thanks for the amazing time! This hostel is next level! Great value. Stayed 3 nights and got the 3rd free. Breakfast was included. Staff were great. Will be back. Stayed here for 3 nights and absolutely loved this place. Getting there can seem hard but it really was simple. Just a 10-15 min ride from town on a bus or Jeep. The location is secluded and beautiful, the staff were fun, (especially Gustavo). We spent a lot of time hanging out on the beach paddle boarding and kayaking. This place really exceeded our expectations. Highly recommend. This hostel is by far the best we stayed at in Colombia. It’s located in the most beautiful location with amazing views of the rock.There’s a really nice pool or terrace to hang out and relax and get some sun. We did a lot of paddle boarding that is provided for free. The food and the staff were top notch. Hostel is still somewhat new but there was always a good group of guests with good vibes.The parties on the weekends here are also epic and great if you like to meet locals. Highly recommend! Phenomenal hostel with good vibes and nice views. Best wifi ive used at a hostel in a longtime and the included breakfast was awesome! My stay at Happy Buddha was amazing, the views from the hostel are worth coming alone! 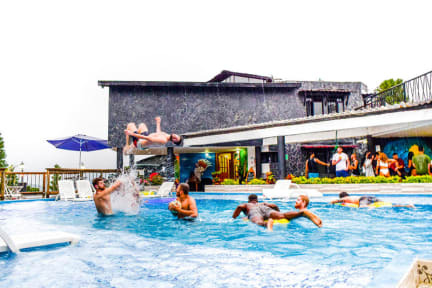 Plus the great staff, awesome pool area, having the choice to use the kitchen or order from the restaurant was a bonus as well, the hostel is always being cleaned and the showers had hot water! What more could you want! Complementary lift down to the restaurant and easy catch a bus into town, Definitely recommend and I would stay again. It’s a bit far from guatape town but that’s what’s it’s about. You don’t actually need to leave this place it has everything. Great views. Pool. Quality. They have potential, but are dropping the ball. Twenty minute drive from anything, they will take you for 5mil. The restaurant and things on offer aren't enough for a place that remote. Especially if you're veggie. WiFi good depending on room. No curtains in rooms with huge windows, really annoying. Doors unable be opened w/o making a terribly loud sound. And the staff came in, maybe to fix them, early, talking loudly. Most people left early due to not liking the hostel. Needs improvement. Needs some love put back into it . We rented the one of the private rooms . No toilet seat on toilet . Pillows were rocks . No screens on windows so we couldn't leave open. First night music was turned up till 3 am very tough to get some sleep.seond night lost power for 24 hours no backup generator. Bar seemed to run out of everything every day . Definitely not the impression of what i thought i was getting .